The orient flight bag is a new and improved adventure bag that will make traveling around the world comfortable and exceptionally stylish. We have updated our original flight bag with a multi-coloured effect to ensure you stand out throughout your travels. We wanted to create a modern version of our previous flight bags to give you a modern alternative. The contrasting caramel and dark brown leather gives the bag a luxury look and feel. We have used a softer material with our new flight bags to ensure you feel comfortable at all times. Despite the soft material, the travel bag maintains durable and will last just as long. Antique leather is a natural material that can lead to small scores. This gives the flight bag a new layer of character. You no longer have to fight through your bag to find your phone. The large zipped compartment at the front of the bag is an ideal storage solution for your small essentials. The identical pockets on the front of the bag adds to the modern style as well as giving you extra storage space. 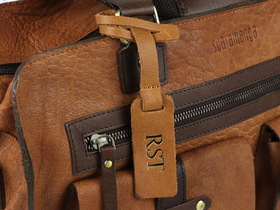 The provided handles and shoulder strap gives you options to comfortably carry your brand new adventure bag. Whether you are a keen adventurer, a dedicated business man, or love to live in the moment, the orient flight bag won't let you down. The Scaramanga leather camera strap matches the vintage leather featured throughout the travel bag perfectly. It will look great when you are carrying your camera in your new travel bag. The personalised bag tag that we offer can be a great way to make your new bag even more personal. Feel free to contact the team to find out more about our personalisation service.